$700 is an ideal budget; if you’re looking for a laptop for casual use and even for business purposes. 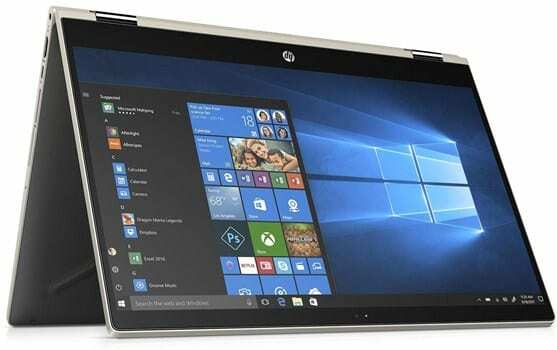 Since the laptop, you’re looking for are 2-in-1 convertible laptops; then it’s an added advantage compared to traditional laptops, the majority of it is the addition of touchscreen and ability to use as a tablet too. Hence, if you’re looking for the best 2 in 1 laptops under $700, then you’ve landed on the right page. All the laptops mentioned in this list are from reputed brands like Lenovo, Dell, HP, Acer and so on. Moreover, all the laptops have excellent customer ratings on Amazon and a positive experience from users and reviewers alike. Now, this won’t be the best 2 in 1 laptop for gaming (if you’re looking for one) because almost all laptops come with Intel UHD graphics, which isn’t ideal for gaming. If gaming isn’t your main concern, then move forward with the list of Best Hybrid Laptops under $700. Lenovo as a brand has always been synonym with providing quality products at a reasonable price point without any compromise. 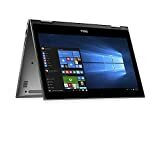 For less than $700, you get a convertible laptop that has screen size of a traditional laptop at 15.6” while still offering Touch Screen, Hybrid Mode and plenty of other features that makes it the best convertible laptop under $700. Let’s talk about the screen first, shall we? 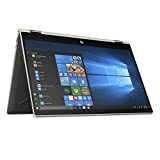 Priced under $700, we can consider it to be a budget laptop, yet for a budget price; you get a great screen that has an IPS panel and Full HD resolution of 1920 x 1080 pixels. 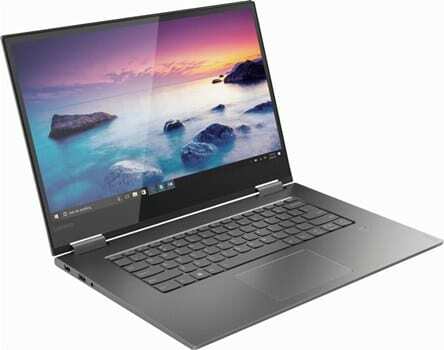 Where most budget laptop screen offers max brightness at 220-250 nits; Lenovo Yoga 730 provides a whopping 300 nits brightness, which is ideal for everyday use and office work in a bright environment. Though, the reflective nature of the panel can be a problem if there’s a window behind or next to you. This problem can be easily solved by using a Matte Laptop Screen Guard. The things that justify this laptop’s price are on the inside. On the hardware front, you get a Quad-Core Intel Core i5-8250U processor that is clocked at 1.6 GHz that can Turbo Boost up to 3.4 GHz on load. To support the processor; there’s a new 8GB DDR4 RAM that is ideal for creating presentations, Word processing and working on Spreadsheets. During leisure time, you can enjoy watching Youtube videos or stream on Netflix via the beautiful Full HD IPS screen. Another exciting hardware for the price is the addition of a 256GB NVMe SSD that is 3-6x faster than traditional SSD and offers Read Speed of over 3000MB/s and Write Speed of around 1500MB/s. Other than that it comes with a USB-C port that provides Thunderbolt 3 port, which can be used to add an External GPU if you want to do gaming. Moreover, the laptop also comes with U-shaped keys that are backlit and a fingerprint sensor that uses Windows Hello feature to log you into the pre-installed Windows 10 Home OS. To utilize the touch screen to the max, you should order the laptop along with Lenovo Active Pen 2 that makes it the best 2 in 1 laptop for drawing. 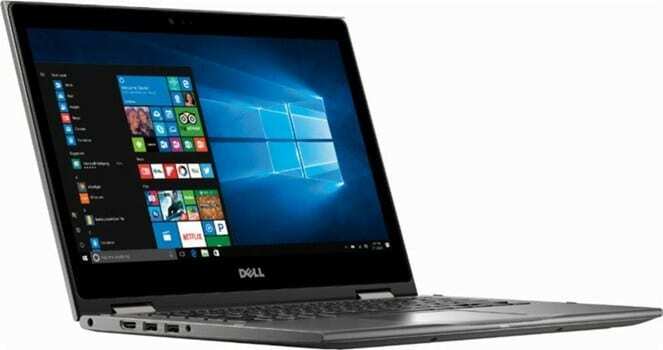 Dell has always been known for producing superior laptops that may seem pricier compared to the competition but still offers excellent built quality and user experience. 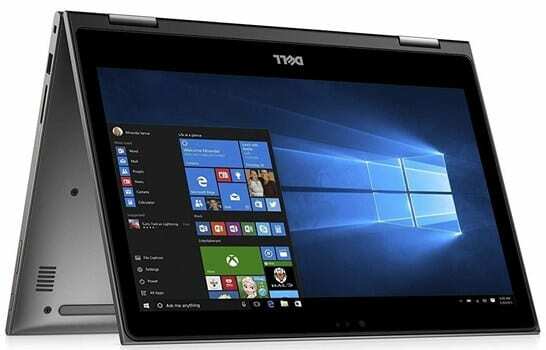 Coming from the Inspiron series, which is Dell’s Cash Cow laptop series, the brand makes a special effort to put out first-class products, and if you’re looking for Best 13 inch laptop under $700, the Dell Inspiron 13 5000 is all yours to have. For a price just under $700, you get a premium Intel Core i7-8550U processor, which is a quad-core processor that has a base frequency of 1.8GHz and can Turbo Boost up to 4GHz and is radically faster than Intel Core i5-8250U processor featured in laptop mentioned above. Coupled with the laptop is an 8GB DDR4 RAM module that has a clocked speed of 2400MHz and offers faster read write speed compared to older DDR3 RAM modules. On the storage front, you get a 256GB SSD, which is slower than the SSD mentioned in the previous laptop; yet it is 8-10x faster than traditional HDD that you get in most budget laptops. Talking about its screen, you get a portable 13.3” screen size that offers Full HD resolution, which gives it a better pixel density and hence every element on the screen looks good compared to a full HD screen on a 15.6” screen. The 13.3” screen has an IPS panel with accurate color reproduction, and the smaller screen size makes it easy to convert this laptop from a traditional position to tablet mode. Even the built quality on Dell Inspiron 13 5000 is top class. Hence you won’t have to worry about moving this laptop from tablet to traditional mode. With so many upsides, there are few downsides to this laptop too. The first one is the keyboard; I’ve used many 13-inch laptops, but for some reason, the keyboard on this laptop feels cramped that makes it a bit hard to type on a word document if you’re in a hurry. Other than that, the design of this laptop too feels conventional, like if you remove the Dell logo; no one would be able to tell that it’s a Dell laptop. There was a time when if you wanted to buy a cheap laptop with reasonable performance, most suggestions would be to buy an Acer laptop. After winning few Red Dot Design Awards for few of their laptops; Acer has been dishing out well designed and nicely built laptops that would make anyone drool over them. No longer have they stayed the underdog and comparing the price to performance ratio; the Acer Spin 5 is marginally pricey than other laptops mentioned in this list, which also few Red Dot Design Awards. To add to the luxury feel, the Acer Spin 5 comes in an all metal construction that gives it a robust feel and the brushed metal finish on the top adds to the premium feeling too. With proper use of plastic and metal, Acer has managed to keep this laptop’s weight down to 3.31 pounds and thickness of just 0.6” on the sides makes it easy to slide in your backpack without any issues. Hence if you’re looking for the best laptop for college students under $700; this is the one you should go for. On the inside; the Acer Spin 5 hosts an Intel Core i5-8250U CPU along with 8GB DDR4 RAM and 256GB SSD that offers a balanced combination of speed and space. What makes this laptop special is that it comes with a dedicated power button and volume rocker on the sides. This makes it ideal to use as a tablet, while you don’t have fidget around the screen to find volume controls. Connectivity features include 1x USB 3.1 Type-C port (not Thunderbolt 3), 2x USB 3.0 port, 1x USB 2.0 port, SD Card Reader, 1x HDMI port along with 3-cell 4810mAH battery that offers battery life of whopping 8-10 hours on mild usage, which is more than any other laptops mentioned in this list. Another USP of this laptop is built-in Alexa software that can be used to automate few functions on this laptop and you can give commands via voice. If you plan on doing some mild gaming once your work is done; then I suggest going with Dell Inspiron 13 7370. What makes this laptop special is the fact that it comes with an integrated graphics card that is 50-70% faster compared to Intel UHD 620 found in most laptops in this list and performs shoulder-to-shoulder with Nvidia MX150 graphics card. Not only that, the CPU that this laptop host comes from AMD from its Ryzen lineup, called as the AMD Ryzen 7 2700U CPU, which is a quad-core processor and offers Turbo Boost speed of up to 3.8GHz on load that has power consumption of 15W, which helps to provide better battery life compared to other processors. Coupled with the CPU is the AMD RX Vega 10 GPU that as I mentioned above is superbly faster compared to Intel UHD 620 graphics found in other laptops in our list. This gives the laptop an advantage of mild gaming when you’re too stressed out from work. Another exciting thing about this laptop is that it comes with 12GB DDR4 RAM instead of 8GB RAM found in other laptops at a similar price point. Dell hasn’t left any stone unturned because it also offers 256GB SSD; hence the American brand hasn’t compromised on anything at all. 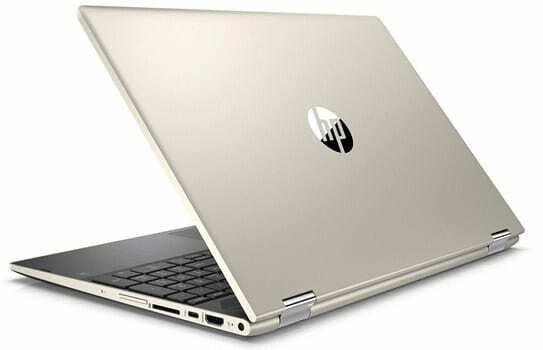 Additionally, the laptop is built using aluminum metal that gives it a sturdy built quality and an assurance that the laptop won’t give up on you any time soon. If you hate using earphones, then you’d be pleased to know that the Dell Inspiron 13 7370 comes with excellent downward firing speakers that are loud and ideal enough to hear audio clearly. The only downside to this laptop is the keyboard as I had mentioned in the laptop above; the cramped keyboard takes time to get used to and is sore to type on. Riding on such a high wave of success, it’s ideal that the brand comes with something exciting for the New Year 2019. And it doesn’t disappoint too. On the inside; the laptop features an Intel Core i5-8250U CPU that as I mentioned above is clocked at 1.6GHz and can Turbo Boost all the way up to 3.4GHz whenever required. Coupled with the CPU is Intel’s own integrated UHD 620 graphics that ideal for day-to-day use and multimedia usage. The outer frame of the laptop is built using aluminum that gives it a premium look and offers a bang for buck performance. Screen offered on Asus Q405UA is a Full HD panel with IPS technology that has excellent color reproduction, while the screen is anti-glare too. On the connectivity front, the laptop comes with 1x USB 3.1 port, 1x USB 3.1 Type-C port which doesn’t support Thunderbolt 3, Bluetooth and Dual Band Wifi too. The keyboard on this laptop is well laid out, but the italicized lettering on the keyboard could irk a few users. Additionally, I’m not too fond of the touchpad on Asus laptops too; as it’s not as user-intuitive compared to the touchpad on other laptops. On the touchpad, you can find a fingerprint reader that can be used to log into your system via the Windows Hello feature. Depending on the update, using the Windows Hello feature; you could also be able to log into your Asus Q405UA via face detection. Being a world leader in smartphones, it might be news to some readers that Samsung also has its piece of pie in the laptop world too. Samsung has been making laptops as long as I can remember and compared to laptops from other brands; the ones from Samsung stable are bit pricey, but they offer ultimate performance without any trade-off. 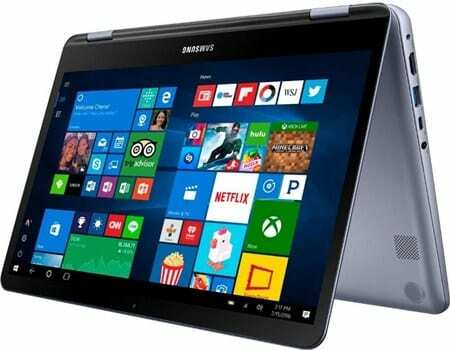 For starters, the Samsung Notebook 7 Spin NP730QAA comes with a 13.3” Full HD Display with a touch screen panel that unfortunately doesn’t come with IPS panel; but it does offer excellent color reproduction. Using the laptop in tablet mode is ideal for doing normal web browsing, watching videos and so on. The touch panel on this laptop isn’t as good as the one you’ll get in Lenovo Yoga 730, but it does get the job done. The tent mode, however, is ideal for watching movies with your family while keeping the laptop on a small desk and controlling the screen via the touch panel. Yet to enjoy the audio at its full potential; I’d say it’s better to get a separate Bluetooth speaker because the provided stereo speakers are meh and that’s the same case with most 2 in 1 hybrid laptops. Note: Make sure to connect the laptop with a Bluetooth speaker via an Aux cable rather than Bluetooth; to reduce the drain on your laptop’s battery. The keyboard on this laptop too is a gem and is nicely laid out with proper tactile feedback while typing. Addition of backlit keys is an added advantage while using the laptop in a dim environment or at night. Inside the metal-plastic body ticks an Intel Core i5-8250U processor and an 8GB RAM that unfortunately is LPDDR3 rather than DDR4 seen in laptops mentioned above. Other than that you get a 256GB SSD that is ideal for creative users who wants to Adobe Photoshop or Illustrator. The Pavilion series is to HP what Inspiron series is to Dell. This basically means that HP too tries to offers excellent price-to-performance ratio in laptops that fall within the Pavilion series. With a 15.6” screen the keyboard supplied with this laptop is Full Size and offers a desktop keyboard-like typing experience. 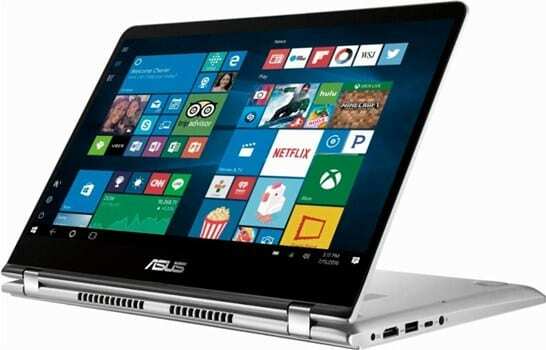 On the design front too, the laptop looks sleek and gives it an edge compared to laptops that your colleagues use. Knowing the fact that being a 15.6” laptop it only weighs 4.36 pounds, which is added advantage if you plan on carrying this laptop from home to work and vice a versa. On the hardware front, this laptop comes with an Intel Core i5-8250U processor that is coupled with 8GB DDR4 RAM, which can be upgraded via an extra memory slot to improve day to day performance of this laptop. Also supplied is a 1TB Mechanical Hard Drive that offers massive storage space to store all your files, music, movies and other multimedia storage. However, you can add an additional SSD and move the Operating System in it to enjoy a fusion of both speed and space. On the battery front, the laptop offers average performance as seen with most budget 2 in 1 laptops. Using applications from Microsoft Suite, you can expect to get around 4-5 hours of battery life on full charge. While a mix of web browsing, watch videos and music reduces the battery life to 3-4 hours, whereas on-load you can expect to get around 2 hours of battery life. On the connectivity front, you get 2x 3.1 USB port, 1x USB 3.1 Type-C Port which doesn’t support Thunderbolt 3 though, 1x HDMI, 1x 3.5mm Combo Jack, 720p Webcam, Dual Band Wifi and preinstalled Windows 10 Home OS. Being a 2019 laptop, the only disappointment I have with this laptop is that it comes with 1366 x 768 screen resolution; instead of Full HD. I hope this article was able to help you chose between the Best 2 in 1 Laptops under $700. If it did then don’t forget to share this article on social media sites like Facebook and Twitter. If there’s any issues related to laptops mentioned in above list, then let me know in the comments section below. Any queries related to laptop you want to buy? Make use of the comment section below to let me know about your problems.